Jack Phillips noticed something while consulting for organizations all over the world. He discovered that training and development departments - even though they are in different countries - experience many of the same issues and challenges. He recognized and then researched, sixteen critical global HRD trends. These sixteen noteworthy trends were formulated by surveying thirty-five organizations in various industrialized countries, as well as actually working with training and development departments across the globe. This firsthand global HRD experience verified and brought to life the trends. As a result of the author's investigation, 'HRD Trends Worldwide' outlines each HRD trend and helps you thoroughly understand them all and, more importantly, put them to good use. This text presents the survey results and explains each trend through examples and evidence. To help you work with the trends, the text provides an examination of each trend's potential impact on your training and performance improvement functions. Every HRD and training and development professional interested in meeting the demands of a competitive worldwide economy should make reading this book a priority. Jack Phillips noticed something while consulting for organizations all over the world. He discovered that training and development departments - even though they are in different countries - experience many of the same issues and challenges. He recognized and then researched, sixteen critical global HRD trends.These sixteen noteworthy trends were formulated by surveying thirty-five organizations in various industrialized countries, as well as actually working with training and development departments across the globe. This firsthand global HRD experience verified and brought to life the trends.As a result of the author's investigation, 'HRD Trends Worldwide' outlines each HRD trend and helps you thoroughly understand them all and, more importantly, put them to good use.This text presents the survey results and explains each trend through examples and evidence. 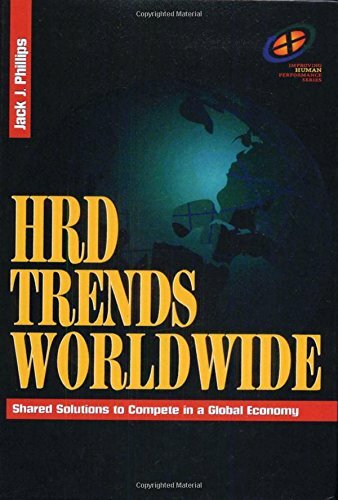 To help you work with the trends, the text provides an examination of each trend's potential impact on your training and performance improvement functions.Every HRD and training and development professional interested in meeting the demands of a competitive worldwide economy should make reading this book a priority. Jack J. Phillips, PhD, is a world-renowned expert on measurement and evaluation and chair of the ROI Institute, Inc., which provides consulting services, workshops and keynote addresses for Fortune 500 companies and major organizations around the world. He developed the ROI MethodologyT, a revolutionary process that provides bottom-line figures and accountability for all types of training, performance improvement, human resources and technology programs and is used worldwide by corporations, governments and non-profit organizations. His expertise in measurement and evaluation is based on nearly thirty years of corporate experience in five industries. He has served as training and development manager at two Fortune 500 firms, senior HR officer at two firms, president of a regional federal savings bank, and management professor at a major state university. Phillips is the author or editor of more than 30 books and more than 100 articles. 3. HRD TRENDS WORLDWIDE: PHILLIPS JACK J. 6. HRD Trends Worldwide Phillips, Jack J.